Many thanks to Parham Azimi, a graduate student in environmental engineering here at IIT that is working with me on a small project, for telling me about a piece of software today that will probably save us hours of labor and frustration in the future: GetData Graph Digitizer. 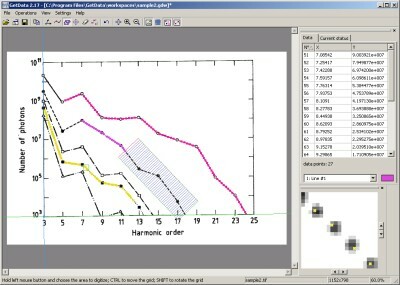 This software allows you to import screenshots of graphs and plots from papers and reports and export accurate estimates of data contained in the figures. We’ve had to do this several times lately, particularly with older papers that only present graphical summary data and not the raw data (we’re talking pre-online-SI here). I’ve wasted more time than I’d like to mention visually “translating” from figure to table so that we could actually use the presented values. This program allows you to import the figure screenshot, define the x and y axes, set the physical length of x and y scales, and then click on individual data points… when you do that, out comes a table of values based on the size and scales of the graph alone. It’s a Thanksgiving Miracle!